The girls and I wish you all a very Merry Christmas! 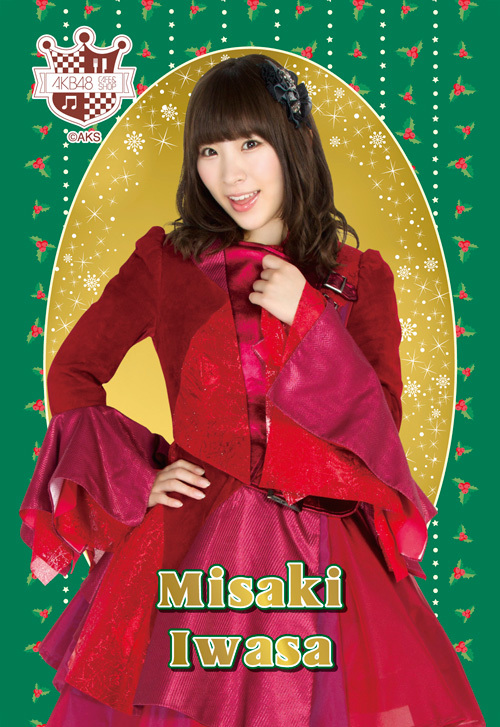 Wasamin, come over here, sit on my lap and tell your Uncle Denny what you want for Christmas! The girls and I* want to wish everyone a very Merry Christmas and a Happy New Year! Thank you for reading my blog this year! *Denny is having egg-nog, and is delicately delusional at the moment. My oshimen … it is Iwasa Misaki. So there. Who is my favorite AKB48 member? Who is my favorite AKB48 member? That would be a hard choice. I like all the members, including all the sub-groups, and sister groups. I even like the members I have not even learned the names of yet. Usually, my favorite member is just which-ever member I happen to see singing on stage at the moment. When I see Mayuyu perform, I think that SHE is my favorite … but when I watch Yukirin — I think “now SHE is my favorite”. Then I thought for a long time that Yuko would be my first choice … and Sayaka Yamamoto? …. DAM. Having said all that, if I had to choose one member as my favorite, it would have to be the great Iwasa Misaki. Often Misaki-san is in the “back row” during AKB dance performances, and sometimes I can only catch a fleeting glimpse of her. Iwasa-chan was also a member of the great Watarirouka Hashiritai 7 (my favorite AKB48 sub-group until the break-up earlier this year.) She is a trouper – and a team player. I believe that Misaki-san is one of the better singers in AKB48. She has a great voice, and she always destroys all her competitors in AKBINGO karaoke battles. True, Wasamin only came in 49th in the 2014 election, but that is OK, because she is still the center of the “Future Girls” unit. Miss Misaki has found a lot of success as a solo “Enka” style singer. I loved her great album “Request Covers” released earlier this year. Her solo work is the opposite of her AKB48 work … but I wish AKB would use her more in a (regular?) idol role. My previous post considered Iwasa Misaki as an Enka-ballad singer. I also want to also share a slide collection of AKB48 trading cards, which feature Wasamin in her role as a Japanese Idol. TRADING CARDS? I AIN’T TRADIN’ NOTHIN’ !!! Starlight: It took 19 years for the stellar nebulae to give birth to this amazing idol.